The senior-most officer who has been sent to Kolkata for this task is superintendent of police, Jagroop S Gusinha. He was working in the Moin Qureshi case, which became the epicentre of the CBI vs CBI controversy. He was part of the special investigation team which was reporting to Asthana. 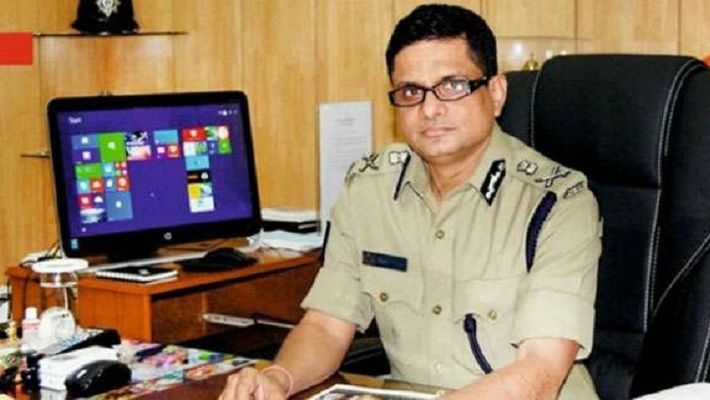 New Delhi: A team of 10 Central Bureau of Investigation (CBI) officers has reached Kolkata on its way to Shillong where it will grill Kolkata police commissioner Rajeev Kumar under the supervision of the CBI joint director. The officers have probed various high-profile cases like the 2G spectrum case, Moin Qureshi case, Srijan scam, bank frauds and cases of disproportionate assets of bureaucrats. All these officers have been awarded for meticulous service. 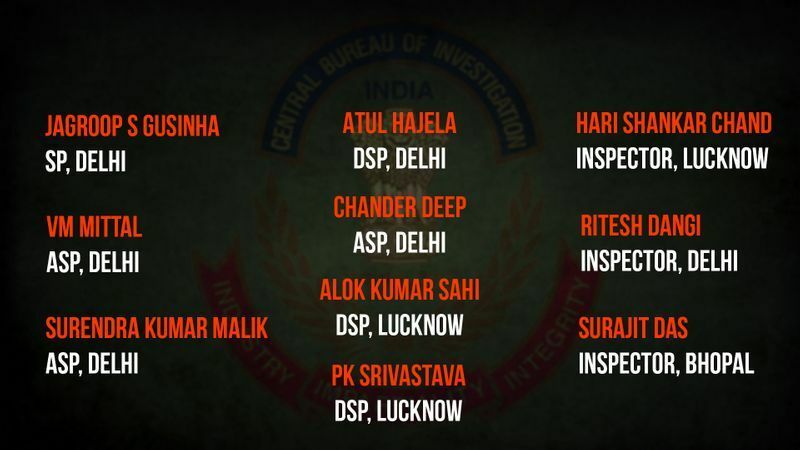 Some of them have worked under former CBI special director Rakesh Asthana. 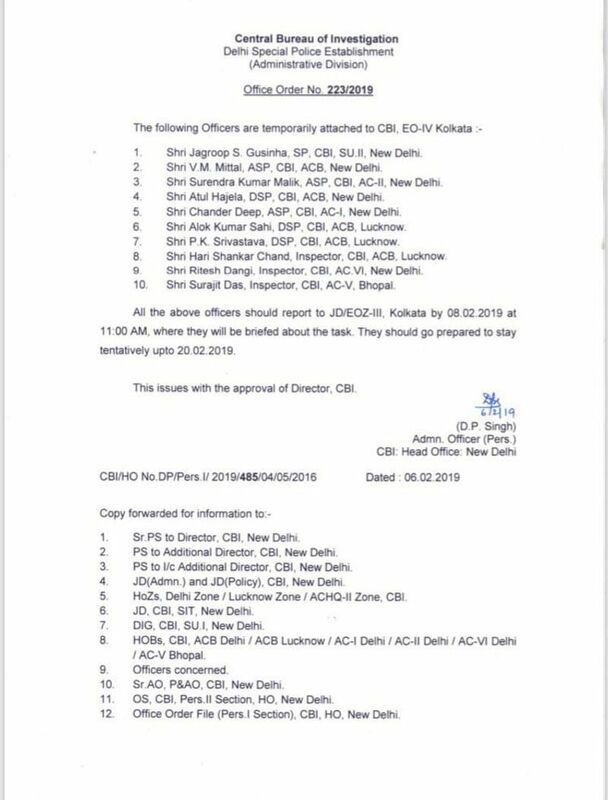 According to a letter issued by the CBI, 10 officers have been transferred to Kolkata and will be based in the city till February 20. The letter also says that these officers will be briefed about the task after reaching Kolkata. From there, they will head to Shillong to interrogate Kumar. The senior-most officer who has been sent to Kolkata for this task is superintendent of police, Jagroop S Gusinha. He was working in the Moin Qureshi case, which became the epicentre of the CBI vs CBI controversy. He was part of the special investigation team which was reporting to Asthana. According to reports, former CBI director Alok Verma had planned to arrest Gusinha in an alleged bribery case. Gusinha has also handled a case against former Haryana chief minister OP Chautala's son Abhay Chautala, accused in a disproportionate assets case. Number two in the team who has been sent to Kolkata from New Delhi is VM Mittal. The officer was involved in the investigation of the 2G spectrum scam, which involved the then telecom minister A Raja. He once told the court that he had not read the chargesheet in the 2G case and that triggered a controversy. Mittal has handled cases against various bureaucrats including a top Indian Revenue Service (IRS) officer alleged to have accumulated assets disproportionate to his income. The third officer in terms of seniority is Surendra Kumar Malik, who has handled Bihar’s high profile Srijan scam, involving various local leaders and government officials. He had gone to Bhagalpur to probe the matter in 2017 as the head of the investigative team. In this case, an NGO Srijan Mahila Sahyog Samiti’s funds were alleged to have been fraudulently transferred between 2004 and 2014. Another officer Atul Hajela was awarded the police medal for meritorious service in 2016 on the occasion of Independence Day. The officer of DSP rank has also handled the case of disproportionate assets involving former chief secretary of Delhi, Rajendra Kumar. Ahead of Asia Cup, Rohit Sharma upset with captain Virat Kohli?